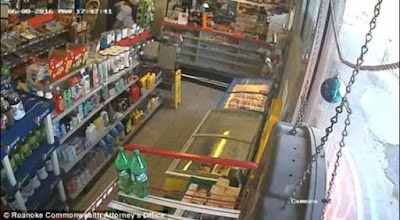 A CCTV footage installed at a convenience store at Shatory Irving in Roanoke, Virginia has exposed the moment a thug, Jamar Bernard Woody, 35, launched a violent attack on his pregnant girlfriend who was on crutches. The incident occurred in June 2016 but the video was only recently released as evidence in court. In the video, Mr Woody could be seen violently kicking and beating his girlfriend, Ms Irwing who was 3 months pregnant and using crutches at the time because of a broken ankle. Doctors testified that Ms Irving's skull was exposed after the vicious beating caused an inch-long split in her forehead. Her child was born premature but healthy last year. Watch the video below.